This was lunch today. I hadn’t planned on preparing it. It was a spur of the moment decision to bake it, which was mostly motivated by the need to use the last bit of gorgonzola that Ned bought at our neighborhood organic grocer.And as costly as it was, I wasn’t about to let that little knob of cheese go to waste. And I’m so glad that I did didn’t. It was really tasty! It was the perfect thing to eat on a bed of salad greens. It was like having all the salad toppings in the form of a tart, including the croutons, which was the delicious whole wheat crust. The apples were soft and pillow-like and the intensity of the gorgonzola was mellowed by the sweetness of the apples and the warmth of the allspice and cinnamon. The crust was the only thing that took time and care. However, that could be easily remedied if you want to use a food processor. Though, I chose not to when I made this tart. I decided to serve this on a bed of baby spinach that I lightly slicked with olive oil then showered with sea salt, ground flax seeds and sultanas. 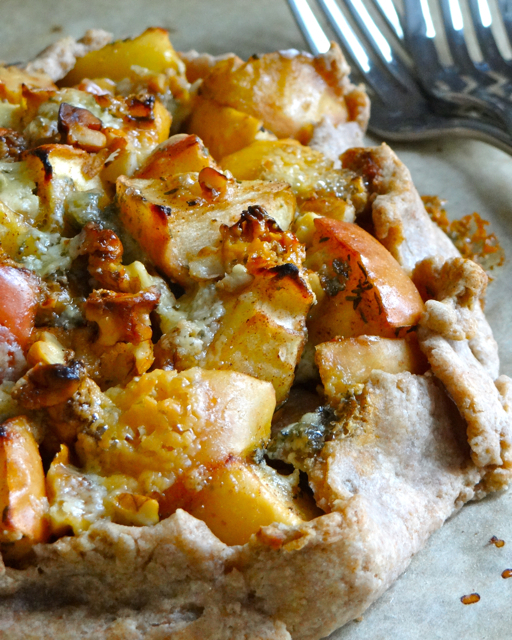 Rustic Whole Wheat Gorgonzola & Apple Tart Serves 2 – or 3 meager eaters. Begin making the crust by whisking the whole wheat flour, 2 tablespoons of all purpose flour and ⅛ teaspoon of salt together in a mixing bowl until well combined. Then add the cold butter, coconut oil. Using either a pastry cutter or your fingers, blend the butter into the flour mixture until you have pea-sized bits. If you choose to blend with your hands, work fast so the butter and coconut don’t soften from the warmth of your fingertips. Then, add cold water, a tablespoon at a time, stirring the mixture in between tablespoons, until you’ve added 3 tablespoons of water. Gently, form the dough into tight ball. Then, shape the dough into a flat disk and place it into a sealed plastic container and in the freezer while you prepare the filling and preheat the oven. To make the filling, place the apples, cinnamon, allspice, pinch of salt, sugar, walnuts, flour and thyme into a mixing bowl. Note: Use the same mixing bowl that you used to make the dough. You don’t even need to wash it out. Stir to combine ingredients. Set the apple mixture aside and roll out the dough. Remove the dough from the freezer and roll it out on a well-floured board into a 12” round. Don’t fuss too much about getting into a perfect circle – rustic is what we’re going for here. Place the dough onto a parchment lined baking tray. Place the apple mixture in the center of the dough, leaving a 1 ½ – 2 “ border. Gently fold the dough over the apples to enclose the filling, making pleats along the way. Brush the edges of the dough with the cream and bake in the center rack of the oven for 20-25 minutes. Remove the tray from the oven and top with the crumbled gorgonzola and bake for an additional 5-10 minutes. Lastly, remove the tray from the oven and let it cool for 5 minutes. Serve warm or room temperature on a bed of your favorite salad greens. Hi Phil! This looks and sounds fabulous – but I’m wondering – can I could use store bought dough instead of making the crust from scratch? Love your blog – every dish looks so inviting! !